I live in a very mixed neighborhood of Oakland, California - we have all races, classes, ethnicities, religions, national origins, and gender orientations here. Because the neighborhood is relatively affordable and close to San Francisco, with a long history of working class and immigrant residents, we find artists, musicians and alternative culture folk living alongside people from very traditional societies. Most of the time we all get along. However, California's Proposition 8 is causing some conflict this month. The proposition, a voter initiative, would define marriage in the state as only being possible between a man and a woman. That contradicts the recent state Supreme Court ruling that such a limitation discriminates against gays. For the last several weeks we have seen demonstrators at busy street corners around the neighborhood, shouting and waving signs in favor of Proposition 8. You see more yard signs (No on 8) on the subject than for the presidential race. There is a shortage of Obama signs, and anyway, 80% of Oakland is expected to vote for the Democratic nominee. No contest. But proposition 8 is causing hard feelings. Today for the first time I happened to drive past the Yes on 8 demo at school hours, with my two young sons in the back seat. Now it was a hot day and I had my chemo turban off, revealing my new growth of hair that looks like a crew cut. I no longer wear a wedding ring because due to treatment it doesn't fit, and I haven't replaced it yet. There I was, a tall, crew cut female with no wedding ring and two children in the car, stopped at the light while the demonstrators screamed into our open windows: A Mom and a Dad! A Mom and a Dad! It happens that my children's father and I are happily married, making me a heterosexual. But so what? Some might think I look like a lesbian. I have many dear friends in the lesbian and gay community, some of whom have celebrated joyous weddings this year. I felt terrible waiting at that traffic light. I felt vulnerable, that a demonstrator might scream at me, taking me for a lesbian mom, and I felt upset for my friends and the people I don't know in the neighborhood who are gay and have young children. What do they feel as they sit at that light? I have that same strange sensation when people say anti-Muslim things around me or even at me - they don't know who I am, and even if I'm not a Muslim, why is it bad to be a Muslim? Don't cast your hate on me, and don't be hating on other people around me. My kids asked me why those people were yelling Yes on 8. I told them that they don't agree with letting two mommies marry each other, or two daddies, but we do. We aren't going to argue with them or yell back either (my 7 year old wanted to). We just don't agree with them. Oakland is likely to go 80% for Obama or more. But this demonstration reminds me how divided our neighborhoods and schools are in other ways. Marriage equality for all does not threaten my own marriage. How can it? The joy, hope and happiness my many gay and lesbian friends express this year as they marry and start families has given me hope, too. My husband and I feel the same about all of our friends who choose to marry, straight or gay: we wish them the best and we are glad to see them set out on this journey that gives us so much love and comfort. I thought of the pictures of the anti-civil-rights demonstrators of the old days, angry white people screaming in the faces of young, frightened black students as they walked into all-white schools to enroll. I tried to have some compassion, too, for the demonstrators, tried to imagine that they must think they are doing the right thing somehow, they must be driven by fears I don't understand. Why am I writing this for the neighborhood list? Well, it's in solidarity with anybody who feels frightened or vulnerable when they pass those demonstrators; for anybody who has children in the back seat who say: why are they yelling "A Mom and a Dad"? For anybody who got married this year and is trying to hold on to the love and good memories of a long-awaited wedding. I am with you and I am voting No on Proposition 8 on November 4th. I've uploaded some more pictures from my trip. Most of the pictures of me are in my friend's camera - when I get more I'll post more. 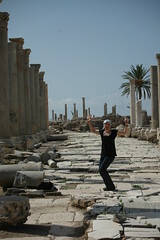 This was taken in the Sea Ruins at Tyre. Warren Buffett: Buy American. I Am. Op-Ed Contributor - Buy American. I Am. - NYTimes.com. Just a little advice from Warren Buffett. He told his rich friends several years ago to sell all their real estate and rent. When he talks, I listen. But as a Lazy Investor I will be following this suggestion by continuing to let our 401(k) do what it does, which is buy stock every paycheck, whether the market is down or up. It's called dollar-cost averaging. Colonel Patrick Lang lists American stocks that reflect certain favorable characteristics. Warning: this is not investment advice. Update: The New York Times has a page devoted to Warren Buffett. Today it's running this Dove's Eye View post as a link! Thanks for the traffic, oh robot aggregator of the Times. Everybody else, consult the link for Buffett information. UC Berkeley study: Green efforts boost economy. From the San Francisco Chronicle. Investing in energy efficiency and alternative energy creates jobs. I have been calling for such investment for years. Yes, these concepts are Keynesian. Our country did pretty well under Keynesian economic policies. To answer the anti-government-spending crowd, I say: we have spent somewhere near a trillion dollars on Iraq, and for what? Our Republican leaders propose that we spend $750 billion on rescuing banks from their own mistakes. Why would spending a mere $20 billion be so awful, especially when that $20 billion will create jobs and give us a rail service that has been proven to work so beautifully in Europe? The trip from Madrid to Cordoba and Seville resembles 580 and I-% from Oakland to Los Angeles: hundreds of miles of sere valley plain, sparsely populated, with plenty of room for a train to zoom at top speed. It's time to invest in infrastructure. California has the foresight to invest a small amount in energy independence and other "green" efforts - let's put more money in that direction. It will return economic as well as environmental dividends. 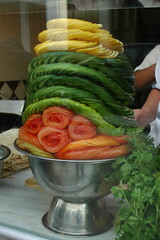 On the Street Called Straight in Damascus, at Baghdadi Falafel, a display of cleverly sliced and arranged salad items. Crunchy Chicken discusses making your own yogurt. Here is the old-fashioned Lebanese method for yogurt-making I learned from my father. I remember he taught all our American friends to do this back in the 70s. I watched him and did it myself as a young teen. Still do every once in a while. The Lebanese way to make yogurt involves no yogurt maker, cooler, thermos or any special equipment. First organize your yogurt container. A glass or ceramic covered bowl or crock is best. I like those Corning or Anchor Hocking glass casseroles with glass lids, but a sturdy plastic container would do. Boil water and rinse the clean container and lid, let air dry. Scald enough milk to fill the container - that means heat milk until bubbles form at the edge of the pot. Don't let it foam over, or heavens forbid burn it! Let cool until you can hold your (clean) finger in the milk for the rapid count of 10. About 110 degrees Fahrenheit I believe, but I never use a thermometer. (Update: Google is our yogurt making friend. Kitchen science link below says cool to 112-115; it will reach 110 when you add the starter). Pour milk into your prepared container. Stir up some yogurt in a cup. Let's say about a half cup for a half gallon of milk. This is the starter, which in our village we call the "rowbih." I pour a little hot milk into the yogurt, too, to bring it to temperature. You want to "break" the yogurt curds. Use a yogurt with live cultures, and don't use one that has pectin or gelatin (or anything else) added. Then stir the starter into the hot milk and put the lid on. To keep yogurt warm, set container on a folded blanket or towel, and then wrap it up with old blankets, parka, whatever will keep it nice and warm. Let sit for 6 to 8 hours. Over the years Americans have suggested all manner of ways to keep the yogurt warm. A haybox, if you already use one, seems like a simple solution; also I suppose a styrofoam "cooler" would also work but I have not tried this. If you already have a warming method you like, go for it. Personally I would not keep yogurt in an oven warmed to 200 degrees (F) for 6 hours - what a waste of fuel. But people do. The yogurt should look firm and have solidified bubbles on the top. When it has set, refrigerate. The kitchen-science, USDA-approved method. Includes non-fat dry milk powder, which many people can taste and don't like. OK it tells you to use a double boiler which makes it impossible to scorch the milk. Whatever. Take your fresh yogurt, leaving some aside for another starter, and put it into a sterilized muslin bag. Add salt. Tie the bag shut and hang it from an olive tree branch. (Or your sink faucet, or anyplace else it can drain. Or put it in a colander). Let drain until it's the consistency you like, from gooey to solid. Turn out onto a plate and drizzle with olive oil. Serve with olives, tomatoes, mint, cucumbers, and pita bread. Or eat unadorned with bread. But must add good olive oil. Alternative draining methods I have seen include using coffee filters, layered cheesecloth or even paper towels in a colander. Your own olive oil from the tree where the lebneh drained would of course be optimal but even Lebanese can't achieve that too often. Most of them buy their lebneh in plastic tubs like the rest of us, these days. 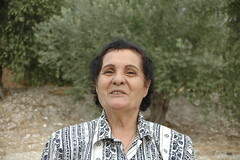 My aunt sang me a song out in the olive groves which I recorded on my MP3 player. Trying to work the recorder made me lose my Arabic so you hear me saying "thank you" in English like an idiot. Normally I try not to mix English words with Arabic. At the end I'm saying "Insha'allah..." and mashing buttons, hoping that it recorded. It did, humdulillah.